Description: We just love this little bully in 8 x 10 inch gold foil. This custom print features a handsome little Bulldog and comes with a premium white mat, ready for an 8 x 10 frame of your choosing. 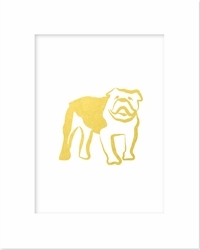 It's just right for bulldog afficionados, college town condominiums or offices. Frame not included. Thanks for stopping by! We hope you'll find something just right for you. Pink Peppermint Paper's selection of social paper and gifts is unlike any other, featuring original artwork and often customizable to fit just right.